Yes, a guy explaining basic physics and how light interacts around the event horizon is super shady. I say grab the pitch forks and torches and lets march on those suckers before they take us out. Ya because so many humans and scientists have actually interacted with a black hole so they not only can see it but know everything about it. Even that could easily be a massive lie. People just repeat what they are told. And being totally unable to EVER verify anything in this field makes it easy for the hucksters. Einstein's Relativity equations predict black holes, but also allow to calculate how light would behave around a black hole. In 1979 (40 years ago), Dr Jean-Pierre Luminet at The French National Centre for Scientific Research used an early computer to run these calculations, and painstakingly dotted out the results with ink on paper, producing a crude image. It's not just an artist's imagination, it's the actual result of calculations, based on what we know about gravity and Relativity. With the actual image of a black hole we have now, we can see how similar both images look, and thus see that Einstein's equations are correct. It's still early days for imaging black holes, but I'm sure future decades will bring even more accurate results and better images. 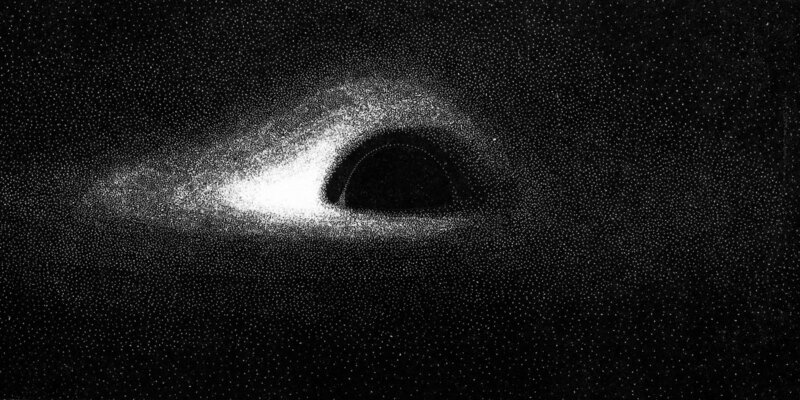 First-Ever Black Hole Photographed named "Powehi" by Hawaii university professor. Powehi means "the adorned fathomless dark creation" or "embellished dark source of unending creation" and comes from the Kumulipo, an 18th-century Hawaiian creation chant. Po is a profound dark source of unending creation, while wehi, honored with embellishments, is one of the chant's descriptions of po. My bad, I had assumed they would image the black hole at Sag A* figuring much closer but I suppose too much dust in the way. Correct. This image is not of Sagittarius A* in our own galaxy, but of a black hole in Galaxy M87, which is 55 Million lightyears away. But they are also working on compiling an image of Sgr A*. That was one of the targets of this imaging exercise, along with this one in M87. They say they hope to have an image of Sgr A* as well in the near future, but it takes a while to compile the data and stitch it all together. After all, the data comes from multiple telescopes (the one for the M87 black hole was data compiled from 8 different radio telescopes spread around the world). And the dust is not really a problem since these images are being resolved in radio waves instead of visible light. While the visible light wavelengths of the EM spectrum emitted by Sgr A* can be blocked by the dust, the radio wavelengths of the EM spectrum can pass through the dust.